The advancement of sedation drug therapy has enabled many pediatric dentists to make use of sedatives during the course of treatment. The use of sedatives in children reduces anxiety, discomfort, and stress-level associated with the treatment. As a parent, it is quite natural for you to feel worried about your kid whenever a dentist is using a sedative on your child. In this blog, we will let you know whether sedation dentistry is safe for your child, and also to what extent. Pediatric dentistry is no child’s play. But, the process has become much safer and faster since the introduction of sedatives. Thus, there is no reason for you to worry. Nitrous Oxide – Nitrous oxide, also known as, laughing gas, is completely safe for children. A mixture of oxygen and nitrous oxide gas is passed through the nasal cavity of the children to reduce the activity of the voluntary muscles. It can also be used for reducing anxiety, unintended movements, and stress level of the children. Oral Conscious Sedation – If nitrous oxide doesn’t show effective results, the dentists make use of oral conscious sedation. Your child will be made to drink a medicated liquid brewed as per your child’s health, level of anxiety, and treatment recommendations. After drinking, the ability of your child to maintain ventilatory function may be impaired but will remain responsive to verbal commands. General Anesthesia – If your child is too young to handle anxiety, then there remains no way for the dentists other than using general anesthesia. A sedative liquid is inserted through the veins of your child via a syringe to shut down all the activities of the voluntary muscles. In simple words, it puts your child to sleep. All necessary dental treatment can be performed without worrying about the stress level of the child. What Happens After The Process Is Complete? You must be present in the clinic when your child is waking up from sedation. It will help them to gain back their confidence. Your child can often feel confused, upset, or can feel like vomiting due to the effects of sedatives. 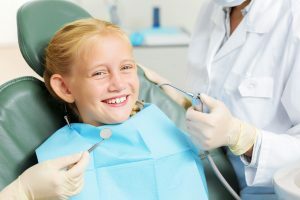 From the above discussion, it can be easily concluded that the process of sedation dentistry is completely safe for your child, and you can easily opt for it. With minimal side effects and ever-rising positive results, this process is gaining worldwide popularity. Hence, if you are a resident of Harlem City, then we, at Joyful Smiles Pediatric Dentistry, can cater to all your needs. We consider your child as ours and never leave any stones upturned in treating them with comfort. Call us now at (708) 794-9526 to book an appointment!